Travel agents are a vanishing breed, but Sidney Marsh, a New York transplant from Mississippi, is holding her ground–at least on land. She is the tour leader on a cruise through Scandinavia for a group of eccentric senior citizens who call themselves the High Steppers. Sidney expects her days to be filled with long meals, shopping expeditions and visits to museums, churches and fjords. But this cruise is anything but routine. There is a killer on board, targeting the High Steppers and quite possibly herself. After the first suspicious death, the captain and his crew are grimly determined to carry on as usual. Disgusted with their inaction, Sidney decides to take matters into her own hands and launch her own investigation. She enlists the halfhearted help of her friend and business partner, the flamboyant and fun-loving Jay Wilson. Suspects abound. What about those two handsome young men who stay mysteriously aloof? One of them has his eye on Sidney. So does another passenger, far too charming and again too young to fit the “High Stepper” mold. Then there’s Captain Vargos, the arrogant ladies’ man whose plans to thwart Sidney’s investigation might include seduction. Who is that crew member shadowing Sidney? Is the theater really haunted? Even the High Steppers themselves are not as predictable or harmless as they seem. The closer Sydney gets to the truth, the less she understands. Shore Excursion is the first book in a new mystery series featuring amateur sleuth Sidney Marsh. 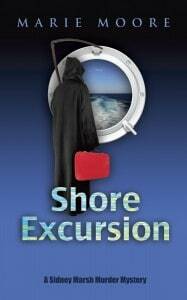 Shore Excursion is the debut mystery novel by Marie Moore. It is the first book in the series starring Sidney Marsh, a 26 year old Travel Agent for Itchy Feet Travel. She gets to travel all over the world with a senior citizen group called the High Steppers. They are a colorful cast of characters ranging from the eloquently reserved to loud and boisterous. Joined by her fun-loving business partner and best friend, Jay, they lead the group on an exciting cruise from Scandinavia to Russia. What Sidney and the High Steppers hoped to be a relaxing adventure abroad turns into anything but. Sidney is accustomed to handling emergencies aboard cruises, especially when dealing with the High Steppers, but the emergencies which she must now deal with are something out of a horror flick. Bodies are beginning to add up on the cruise ship and it couldn’t simply be a coincidence that all of the victims are High Steppers. Sylvia must now decide if she is going to let the cruise line handle the case, which they are not too keen on admitting to the fact that there is a murderer aboard, especially Captain Vargas, or she can just dive into the mystery herself. Without much help from Jay, Sylvia attempts to solve the mystery and manages to also put her life in danger. Now I really did like Sylvia as a character, but at times she did some pretty baffling things. Part of the trip she was concerned about the possible killer on the prowl, and the other time? Well, let’s just say that she was trying to find love. That is somewhat questionable behavior for someone who is supposedly concerned about her clients being killed. Also, her taste in men proved that she does perhaps have the “Marsh Curse” (aka questionable taste in men). That potential curse lands her barefoot and in a tree, but I won’t go into details. You will just have to read it for yourself. Outside of a few discrepancies, Moore’s debut novel is a winner. Her world was so descriptive that I felt as though I was on the journey with the High Steppers. Also, the conclusion was satisfying; especially with the unexpected twist just when I thought the mystery was solved. So if you are a fan of good mystery, grab your favorite latte and cozy up with Shore Excursion. Kellie, I’m happy that you enjoyed the twists and turns of Marie’s mystery. Thanks to you and Stacie for featuring “Shore Excursion” on the blog. What a great review! Thanks so much, Kellie, for your kind words. I’m so happy that you liked Sidney and Shore Excursion, and hope you will also follow Sidney on her next adventure, Game Drive, which should be out by the end of 2012.